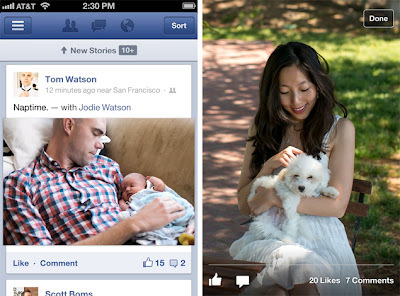 Revamped Facebook app for iOS ! Slow and steady wins the race is history. The need for speed is the need of the hour not just for techies, but users everywhere. Facebook has finally realised this fact and updated its iOS client to version 5, which has bid adieu to HTML 5 and says hello to Objective-C. The social networking app is now twice as fast with Photos, News Feed and the app itself launching quicker than ever. With this update, iPad users can now access the Timeline profile view. The app has been built from scratch over the past nine months to bring a major performance improvement. We take a detailed look at what's new under the hood. Now when you launch the app, it opens in the blink of an eye as opposed to earlier when you would continue to stare at the logo for a couple of seconds at least. It directly opens into the News Feed, which is more responsive and speedier than before. The navigation bar now slides out with a punch. IBM produces first working chips modeled on the human brain !